All units heat as well as cool are very energy efficient to run. Most run on an A+ energy efficient rating. These units are compact and have a slim height profile to enable the unit to be located on walls above doors and window openings. Wall mounted units come in a range of designs and colours including black, silver and white. Cassette system units are designed for commercial buildings such as offices shops, retail stores, meeting rooms, open plan areas, health and leisure centres, and IT computer rooms. These cassette system are fitted above the ceiling and only the front fascia grill is showing. 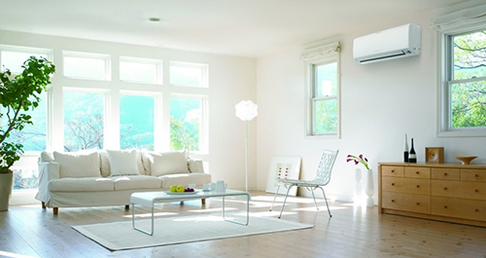 Variable refrigerant flow (VRF) can run up to sixty four indoor units from one outdoor unit. The system that we design and install provides comfortable highly efficient heating and cooling for small or large scale properties. Further, our smart VRF systems can heat or cool different temperatures in different rooms of a building, enabling a happy work environment. These are the most cost effective option for larger buildings providing the ultimate in energy efficiency.